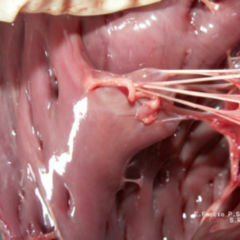 The chordae tendineae are thin chordae that are fixed to the atrioventricular valves of the human heart at the free ends. 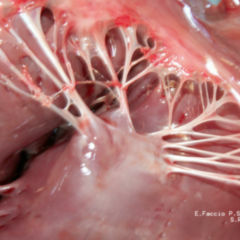 The chordae tendineae prevent the return of the flaps in the atrium during systole. 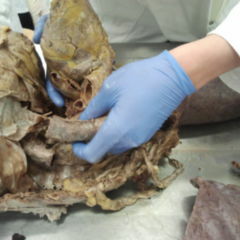 They are suspended on the inner heart wall from the so-called papillary muscles. Its main component is collagen type I, III and V. The exact composition of collagen changes throughout life, resulting in diminishing flexibility of the chordae. 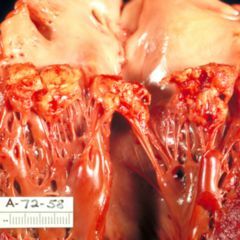 The chordae may rupture as a consequence of myocardial infarction (tendon tear), resulting in valvular insufficiency.